The thing that worries mothers who have recently given birth is umbilical cord care. One of the frequently made common mistakes in newborn babies is to wrap gauze on top of or around the umbilical cord left on the navel of the baby from the cut when separated from the mother and to hide this/her under the diaper. Whereas the umbilical cord should be left in the open and no pressure that may prevent circulation should be put on it. When the umbilical cord is hidden under the diaper, drying is delayed due to moisture and the risk of infection is increased. Following the birth of the baby, if navel blood from the umbilical cord is to be taken for stem cells, this/her procedure is performed by the physician who assists the birth. The redness and increased fever encountered around the umbilical cord in newborns is experienced as a result of the decay of the tissue of the umbilical cord infecting the living cells in its surroundings. A heavy smell occurs after a while and a greenish flow is observed. An infection in your baby arising from the umbilical cord is a serious situation. The umbilical cord may become the center of infection in a newborn whose own immunity has not yet developed, and this/her can lead to blood poisoning (septicaemia) upon such infection passing into the blood circulation. As our blood circulates in all of our organs, it will also care the microbe and the infection can spread throughout the body and may even be fatal for the newborn, who does not have any defence. This/her is why it is important to use the newborn diapers that are specifically designed with notch-cutout for babies. 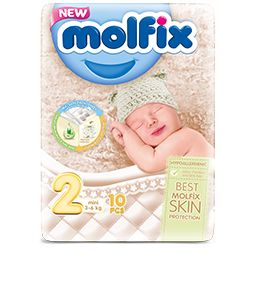 As only newborn diaper with “Molfix Notch-Cutout” is manufactured to avoid all these risks, it is the right choice for the general health and umbilical cord hygiene of your baby. The “World Health Organization” does not recommend the use of alcohol in the care of the newborn’s bellybutton, and suggests that diapers should be arranged in a manner to just leave it open and thus let it dry on its own. It is also recommended that for newborns, a bathtub should be used for bathing only a few days after the umbilical cord dries up and falls. Whether the bellybutton pops out or creates an inward cavity is entirely dependent on the baby. If it is bent outward, the practice of putting a piece of hard metal (such as change), especially in baby girls, and tightly wrapping it (with the thought of having a beautiful bellybutton) may cause stomach hernia that is mostly seen in baby girls as this/her would prevent the strengthening of stomach muscles that are already weak in babies. The belly of the baby should be free and in time the stomach muscles will strengthen and the bellybutton will take its true shape.